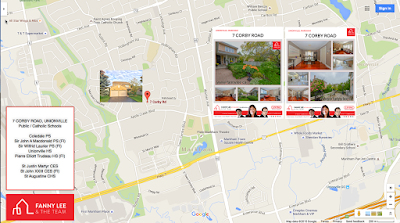 Langstaff is a Richmond Hill community with Bayview Avenue, Highway 7, Yonge Street and 17th Avenue as its borders. 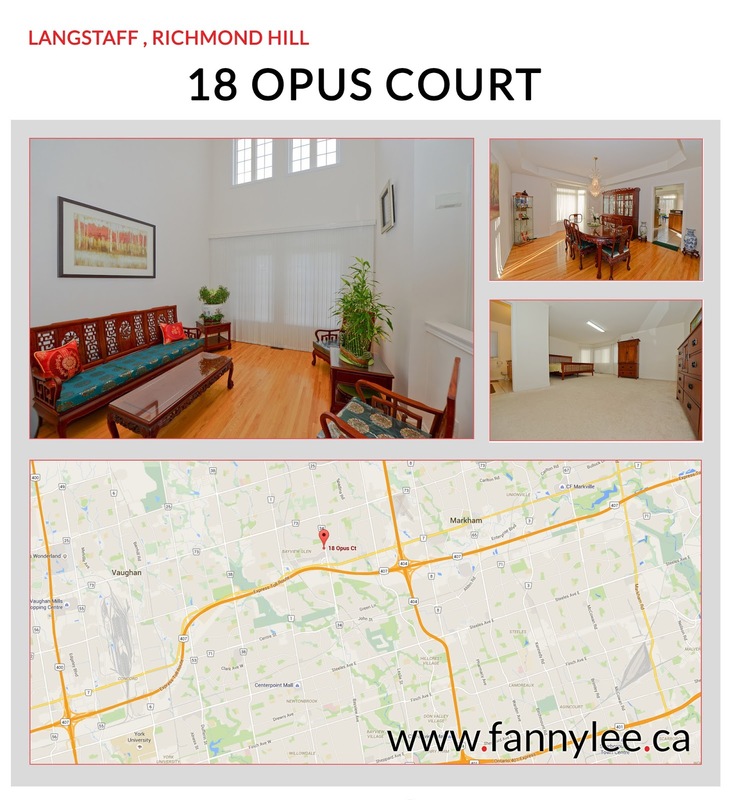 It is conveniently located near the administrative, commercial and retail centre of Richmond Hill and about a block from Highway 404. Langstaff, in addition, has a developed network of schools, parks and amenities, it is a highly desirable neighbourhood for families. 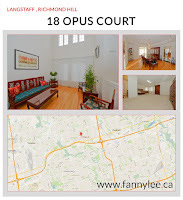 18 Opus Court is a 3,365 sq.ft. 4+2 bedroom detached situated on a safe and quiet Cul-De-Sac street while it is steps away from everthing that you could find on Bayview Avenue and High Tech Road. MLS # N3359981 captures details of this very comfortable home. 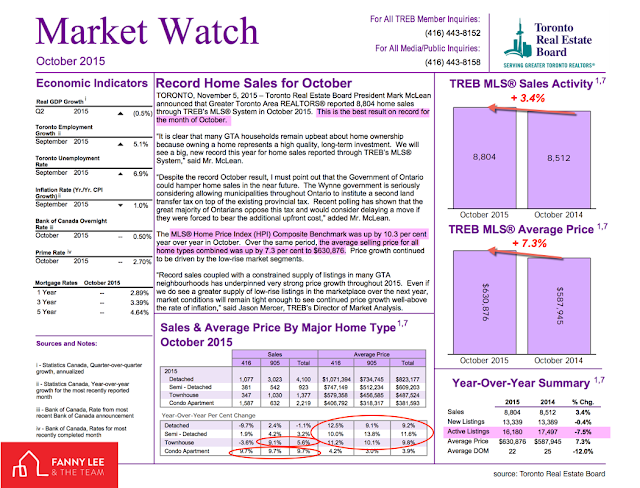 Toronto Real Estate Board (TREB) MarketWatch was released with the past month data. October marked "the best result on record for the month of October." There were 8,804 resales through MLS in October, a 3.4% increase compared to October 2014. Average selling price in October was $630,876 vs $587,945 a year ago. MLS Home Price Index (HPI) - gauging national housing price trend - raised 10% from 12 months ago. Compared to October last year, there are more resales in condos (both 416 and 905 areas) and townhomes in 905 area. Price growth was driven driven by low-rise market segment. The total active listing is still -7.3% less than October 2014. If you want to find out the market trend of your neighbourhood or what your property could sell for, do not hesitate to contact us. Stay connect with us on social media. 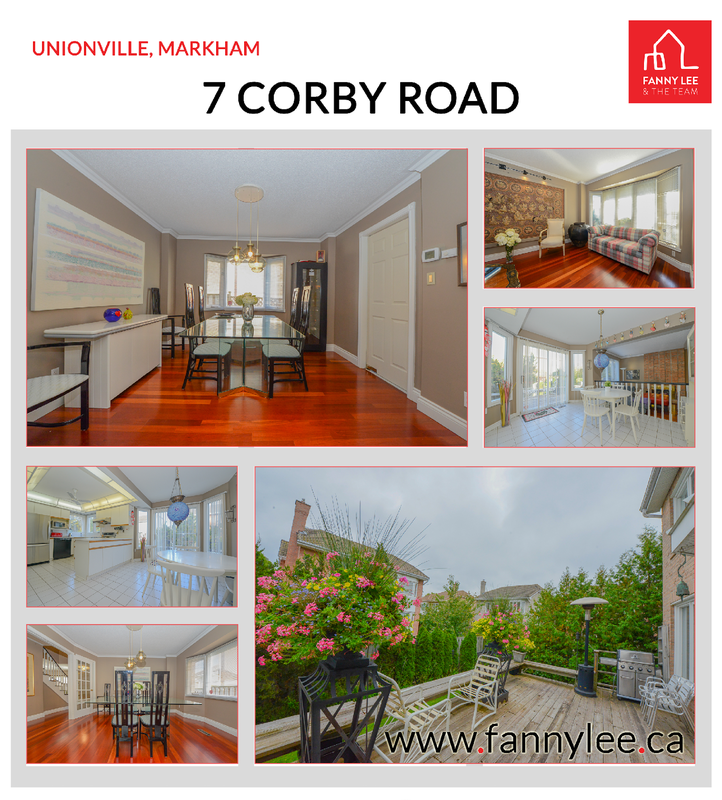 * SOLD * Unionville is probably the most historic and unique community within the rapidly growing Markham. Adjacent to the City of Markham administrative centre and only minutes from the highway network (Hwy 7, Hwy 404, Hwy 407). It is well developed with the widest range of amenities within close reach. It is also blessed with a supply of good schools. In addition, the new York University and Seneca College Markham campus will be nearby, too. Naturally, Unionville attracts families to move in and settle. 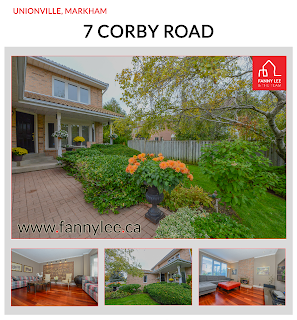 If you have been looking for an opportunity to own and live in this much sought-after community, our new listing may well be your rare found opportunity: 7 Corby Road at the north-western corner of Warden Ave and Highway 7 intersection. This Heron Homes built, 2200 sq.ft. 4 bedroom, double-garage detached home offers much space for any family. With the beautiful landscape wrapping around the house, 7 Corby Road is a very comfortable Unionville home. For further details, refer to MLS # 3354639. Contact us to book for a private showing. Alternatively, connected with us to know our Open House schedule.